This is another challenge I’m entering for the month of October. This time it is for Scrapbookers Anonymous blog. 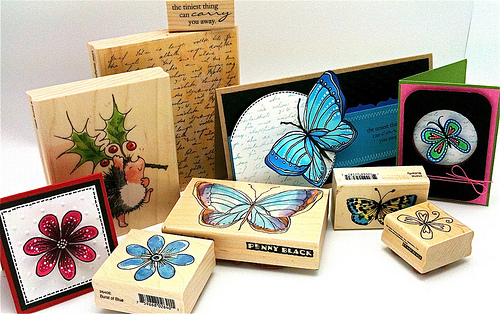 The requirement is to use a minimum of 3 different patterned papers from 3 different manufacturers. Most of the papers I have are from the same manufacturer i.e Basic Grey or MME so I have to really dig into my stash to see whether any of the suitable papers for this challenge come from 3 different manufacturers. 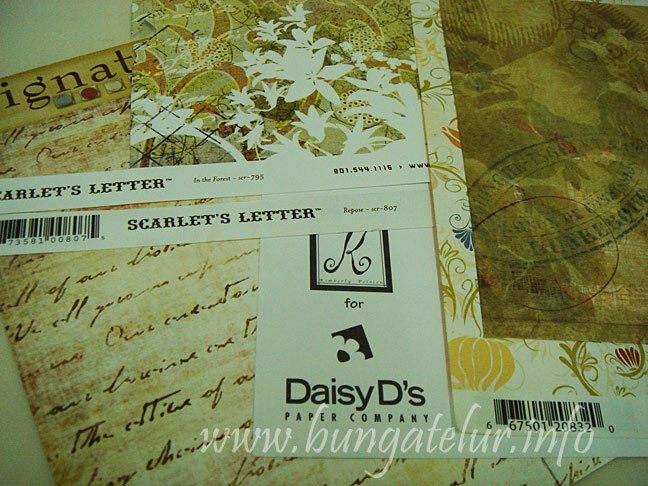 I finally found 2 from Basic Grey (Scarlet’s Letter pack), one from My Mind’s Eye, one from Daisy’s D and the floral orange one from Chatterbox..phewww, all 5 papers that I bought since 2005! At first I planned to scrap the pictures of our trip to the beach for anniversary in 2005, but I couldn’t find papers that complemented those pictures and fulfill the requirement of this challenge. Thus I changed the subject to this blooming gardenia. The last time it bloomed was in 2008 (or was it 2007) and after that she decided to stop blooming. Until recently she decided to bloom again. I guess gardening is like life. You put all that you can and then what you can do is wait, pray and hope that whatever you do will be fruitful, and one day walla just as you thought you would never get what you want, life gives you the unexpected. I chose the life sentiment from Rhonna Farrer rub on to express what I feel in this layout. I also love the fact that I finally get to use the journaling page from Making Memories Noteworthy notebook…I have been keeping it untouched in the stash for so long. The silver sentiment “your unique gift” is from Making Memories Charmed Phrases. 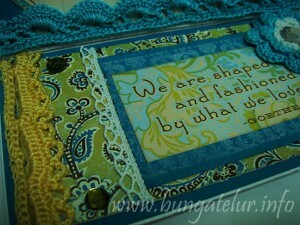 The ribbons and other embellishment like felt rick rack and lace are mostly from Making Memories. 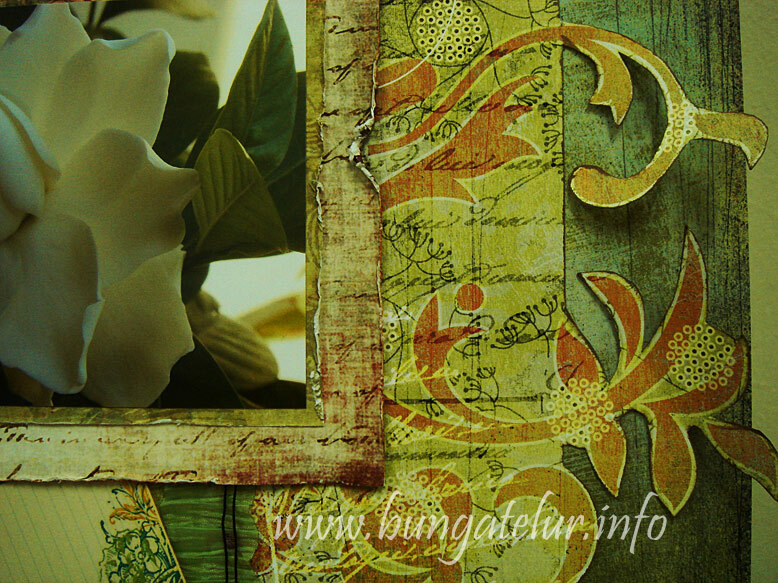 I am using most of the materials which I bought since 2005, the year that I starts scrapbooking seriously. 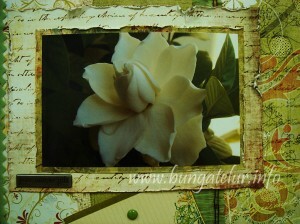 I am all into paper distressing these days, so that’s why I distressed the paper that I used to mat the picture. For the patterned paper on the right, I decided to cut out according to the floral design and let it stick out a bit, giving a 3D effect on the layout. I thought of using flowers as additional embellishment but that would be like overshadowing the great gardenia picture I want to emphasize..heh! I have never done a card for fall/harvest theme. So when I found a few challenges that require such theme, initially I was really out of inspiration on what to do. 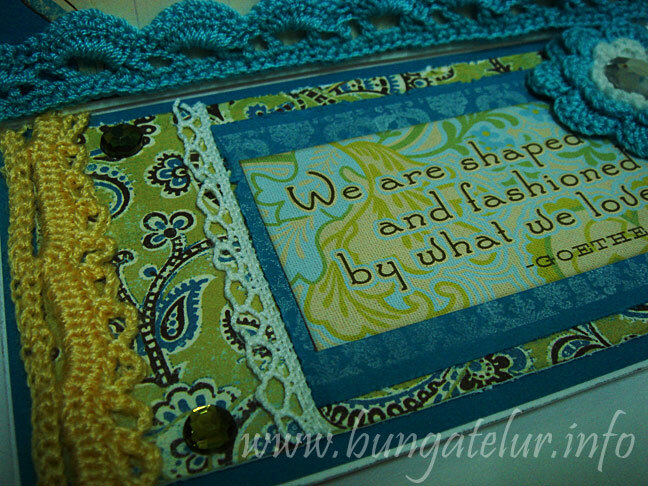 Thanks to Kathy of Kathy Winter Designs for sharing her wordart, I decided to print the sentiment and use it on my card. At first I thought of using digi stamp with image of pumpkin or anything related to harvest, but then I don’t have any other tools to color the image..huhu! I guess in the end we have to make do with whatever we have, right? 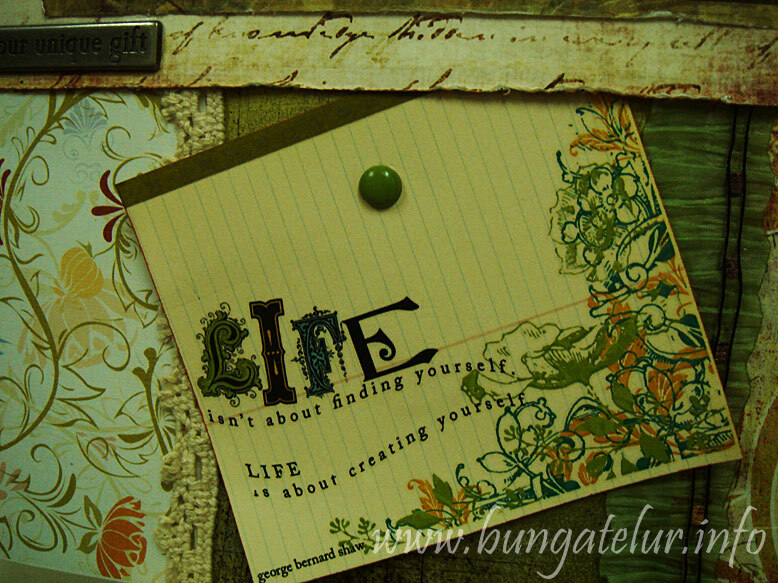 And be thankful for the opportunity to be more creative and improvise with the limited choices in life. As part of the requirement by Basic Grey Challenges blog, I used Basic Grey patterned papers in the Stella Ruby collection. I have bought the pack for many years now and yet to open the packaging..huhu..what a hoarder I am! 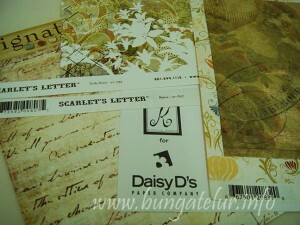 Luckily the Stella Ruby collection has papers in autumn color palette. This is also the first time that I use patterned paper to embellish chipboard. Thanks to the tips that other scrappers share, I didn’t paste the paper till the edge of the chipboard. Instead I inked the edge to cover the chipboard. 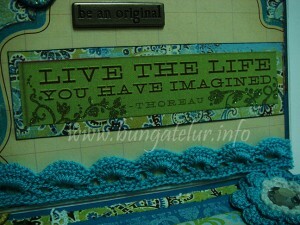 It made my job a lot easier than having to trim the paper at the edge with craft knife..heh! I also used buttons for the first time. This time I used buttons that already have adhesive at the back. Maybe next time I will try using raw buttons and learn how to tie the thread as artistically as possible. 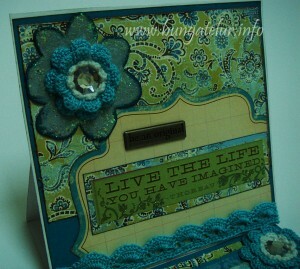 I am also entering this card for Give Thanks challenge in Simon Says Stamp blog. I was hoping to take part in their Easy No Cook Recipe Challenge last week but I was too busy and missed the dateline. Updated: I am entering this into Anything Goes Challenge at Top Tip Tuesday. Who knows I might be one of the lucky winners for the gift certificate! 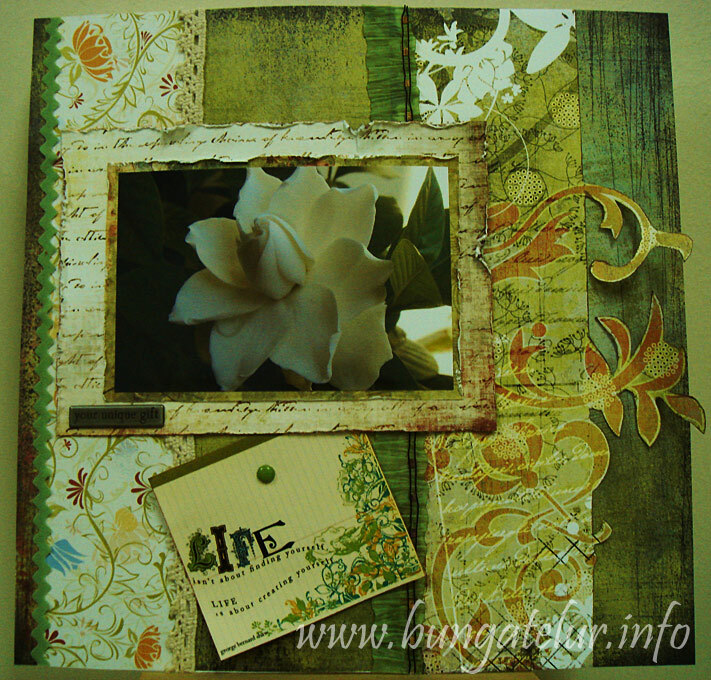 Once again the scrapbooking store at The Curve, Papier is having another blog challenge. This time it is photo inspiration challenge. What we have to do is to create a card or a layout based on the photo below. 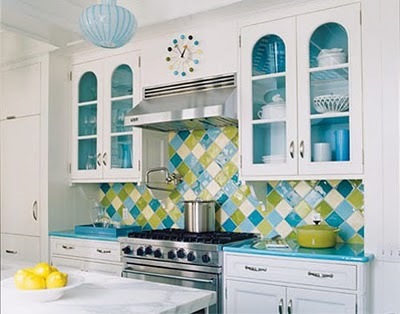 Be inspired by the colors, patterns or the shapes in the photo. Since I’ve never done an easel card before, I decided to make one for this challenge. Initially it was a real challenge for me to come out with something related to the photo. What I have in mind is to use the colors in the photo. I browse through all the patterned papers in my stash to check whether any of them has the color combination and I found one by My Mind’s Eye. It is Magnolia #MG1020 Serene “Dream” Floral/Teal. 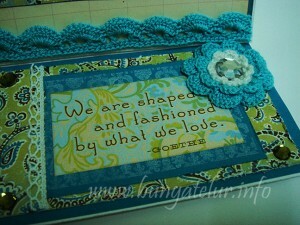 I also want to use the crochet flower and edging that I handmade especially for this challenge. I inked the Bohemian chipboard in flower shape in Aspen Mist, inked its edge in Ocean Depth and then applied Jo Sonja Opal Dust on it. 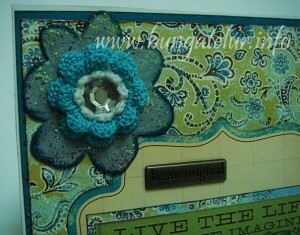 It took me a while to wait for the glitter glue to dry before I could test with the blue crochet flower. I didn’t have any stamp that is suitable for the card sentiments so I used K&Company Amy Butler Belle Quilted Words stickers. I am always fond of cards with motivational sentiments. Not sure who I will post this card to this time..hehe! Oh, I am so happy that I finally get the chance to use one of the journalling pages from MM Noteworthy notebook. The silver sentiment “be an original” is from Making Memories Charmed Phrases. Once I have finished making the front card, I added Prima crystals to the layout inside of the card. I never thought that making an easel card is that easy. Next time I hope to make one in round shape. I couldn’t get a good full view of the card for a picture. But I hope this will do to show how the easel card looks like once folded up. Basic Grey Challenge blog is having another challenge. This time the theme is sparkle. I really don’t have anything sparkly (like Stickles or embossing powder) except for a bottle of Jo Sonja Opal Dust which I have been using on decoupage item. This time I decided to try it on the chipboard and the felt fusion. Luckily it worked on those Bohemian My Mind’s Eye chipboard and Queen & Co felt fusion. 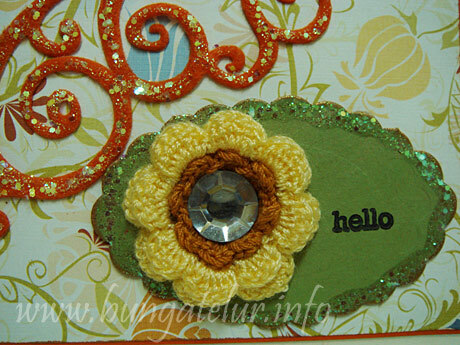 Remember I mentioned earlier that I am going to use my own handmade crocheted flower in the next LO or card. Well, I managed to use one flower on the card above. Here is the close up look of the flower. The only Basic Grey item I used for this challenge is the “hello” stamp. 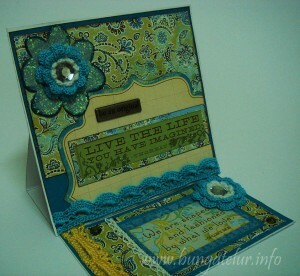 The patterned paper is Canopy Floral from Chatterbox. As usual most of the items used in this card are what I have in my stash for the past 4 years..huhu! Oh, thanks to the eBay seller who gave me the bonus gift of Kaisercraft clear crystal. I was able to use the biggest piece of the crystal as the centre of my crocheted flower. It adds up the sparkle effect on the card..heh! 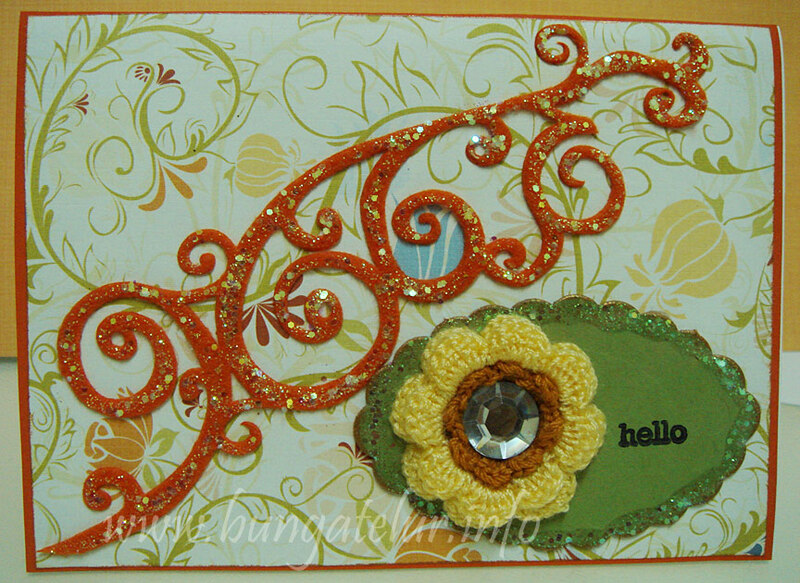 I have found another challenge blog that allows people to combine challenge – Polka Doodles Week 40 Challenge – Make Your Own Embellishments. 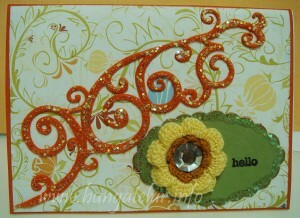 I am entering this card for the challenge as I fits the criteria of making my own embellishments.